Robo Recall coming to Quest! 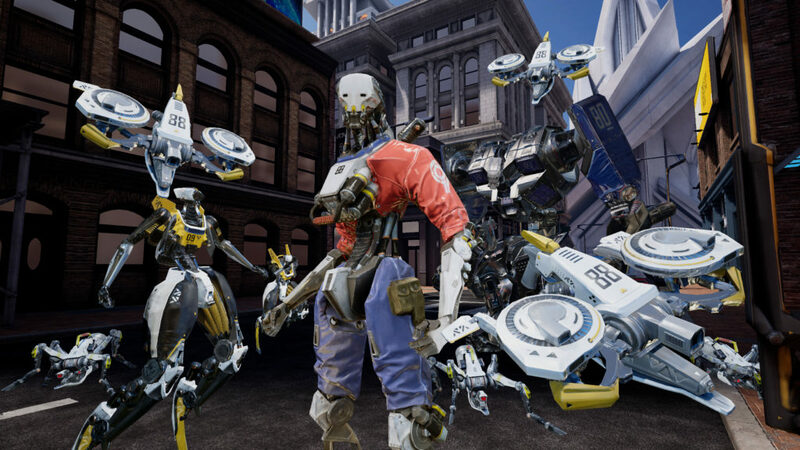 Check out the Oculus Blog to learn more about how Drifter helped bring Robo Recall to life on the Oculus Quest! Gunheart – Now for LESS MONEY! Gunheart is now only $19.99 in all the places you can buy it! You got $20 and a PC? You can play Gunheart! You got a VR headset for that PC? You can play Gunheart in VR! Rig Mods! That’s right. They’re not just for guns anymore. Just like with guns, there are multiple tiers of rig mods, and things can get pretty crazy once you unlock some ultras. Increased air control is like falling with style, but Ultra increased air control is pretty much flying. Play around and find your favorites. Lone Wolf Difficulty. “Elite mode is too easy!” Okay, so pretty much no one has actually said that, but we’re doing this anyway. Take elite mode, make the enemies tougher, don’t let friends join, and you’ve got lone wolf mode. Enjoy, sadists. Oh, you’ll need to 3 star a mission before you see this pop up as an option. Completely New Movement System. You can now strafe over a lot more terrain and obstacles than you could before. You’ll also find that Planet Fortune features fewer tripping hazards that you’re rig will get stuck on. Also, air control has been boosted so you can finesse those tricky jumps. Throw on the air control rig mod and you’ll get even more! PVP Balance and New Features. We’ve made a balance pass on the weapons. Most notable change was a nerf to the pistols who were a bit too effective at killing folks across the map. The carbines got a little love and a buff to go with the love. Full-auto mods will now negatively impact damage a little more than they did before. New PVP health system! You’ll now have less of it by default, but you can pick up armor and shields around the map. With pick-ups, you can even get some extra to have an overshield. The way enemies spawn into each room has been updated. You’ll find a lot less instances of guys trickling in. They’ll also spawn a bit closer to you so you won’t have to backtrack to the start of a room to find stragglers. Buzzkills do more than just annoy you now. They’ll eventually get tired of you ignoring them and they’ll dive bomb you and blow up. Don’t fret, buzzkill lifespans are very short anyway. Dhino projectiles will now leave a … substance … where they land which makes that area uninhabitable for a while. Zombugs are tougher, but removing their limbs will help take them down.